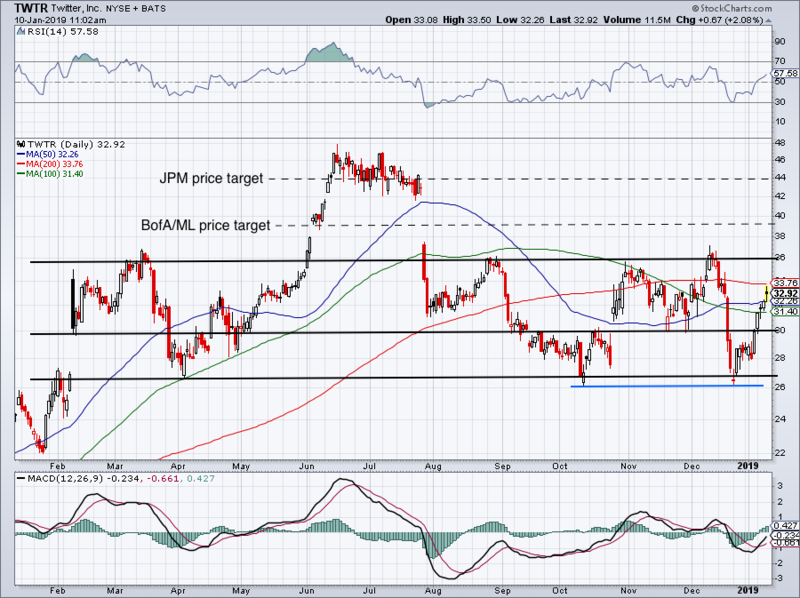 Twitter stock could rally 22% according to Bank of America/Merrill Lynch analysts and 35% according to JPMorgan analysts. Either way, that's a huge performance. So far, 2019 has been good to Twitter (TWTR - Get Report) , with shares up more than 14%. Analysts are warming up to the stock. Thursday shares closed up 2.6% at $33.09 after analysts at Bank of America/Merrill Lynch gave the stock a double upgrade, moving from underperform to buy and boosting their price target from $31 to $39. The target implies almost 22% upside from Wednesday's close. According to the analysts, Twitter is gaining traction with users in the 18 to 29 years-old demographic, while suggesting more users are likely to spend more time on the platform. If that's the case, Twitter has upside potential to engagement and revenue. JPMorgan was also pushing for Twitter stock. On Tuesday, analysts named Twitter one of their Best Ideas, along with Facebook (FB - Get Report) and Amazon (AMZN - Get Report) . They have an overweight rating and $44 price target on Twitter, implying around 35% upside. The analysts argue that Twitter is improving its platform, as well as the ROI for advertisers, making it a more attractive outlet for marketers. Given the bullishness from these two analysts, should investors be more optimistic about Twitter? Facebook and Amazon are holdings in Jim Cramer's Action Alerts PLUS member club. Want to be alerted before Jim Cramer buys or sells FB or AMZN? Learn more now. Twitter has been a volatile name over the past year, although the market-wide volatility in the fourth quarter didn't help. Nor have the meltdowns we've seen in Snap (SNAP - Get Report) and Facebook over the past six to 12 months. After this year's quick rally, we've already seen TWTR push through both the 50-day and 100-day moving averages, running into the 200-day as we speak. Ideally, Twitter stock would consolidate above the $31.40 mark, which is roughly where the 100-day and 21-day moving averages rest. More likely would be a pullback to the $30 level, though, particularly if we get a notable pullback in the broader stock market. Either way, we need to see Twitter stock push through the 200-day and then the $36 level if either analyst wants to be right with their call. On that note, they have plenty of time to see it play out, as we're only 10 days into January. Up five days in a row and more than 16% in that span, Twitter likely needs to cool off. Let's see where support comes into play, then we can see if it will challenge the 200-day.